This information is being presented to our readers as an introduction to plans we have for erecting a Highway Marker in his honor. It is possible that we may also erect a Rev. War Soldier tombstone. To date, our society has erected Highway Markers for six Rev. War Soldiers who are buried in Wayne County. The cost of the last one, which was for James Maynard, cost about $2200.00. These funds have to be raised by donations from those honoring these Patriots. Our society does not have the funds to pay for them. It is our hope that you and others will consider donating to this cause. Donations may be made in any amount. We would prefer that they be made by check, for we can then keep a better account of the donors. If, for any reason, the marker does not get erected, the donations will be returned to those who gave. 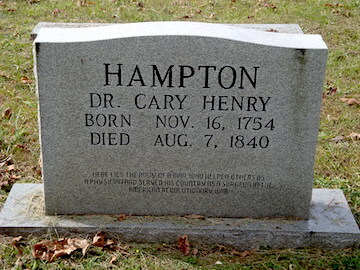 Dr. Cary Henry Hampton was born November 16, 1754 at Buckland, Prince William County, Virginia. He died August 7, 1840 in Cabell County, VA, present Wayne County, WV. He was the son of Henry Hampton and Elizabeth Cary Hobson. 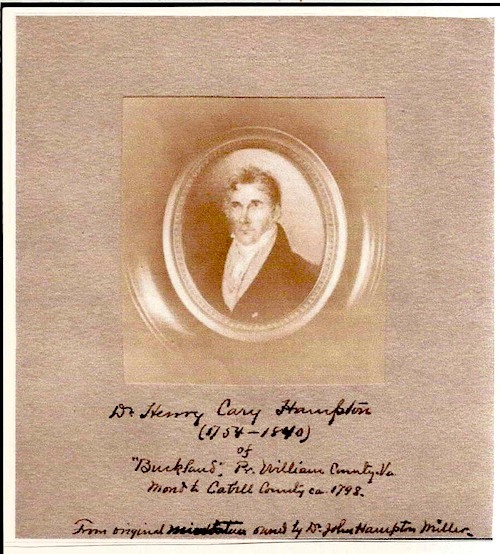 Dr. Hampton served as a Surgeon’s Mate during the Revolutionary War, and practiced medicine in Prince William County before settling in then Kanawha County about 1800. His wife was Elizabeth Plunkett, born February 8, 1758 in Orange County, VA and died December 10, 1802 in Kanawha County, VA. They were married May 4, 1779 in Fairfax County, VA. They had ten children, most of which went west. He settled on a “Soldiers Claim” which was located at the present site of Marshall University. About the year 1802 a traveling artist stopped and spent some time with Dr. Hampton. During the visit, he painted a portrait of Dr. Hampton, shown at the left. and rode to the Hampton home. Dr. Hampton, having heard the gossip, was concerned that the Colonel had come to harm him. So, just as the Colonel started through the gate, Dr. Hampton shot and killed him. This is quite possible what caused Dr. Hampton to sell this property. He sold this land and moved to a tract of land which he and his brother William had inherited from his father by deed dated March 10, 1778. His brother William, who spent most of his life in the area of Catlettsburg, KY, transferred his one half interest to Dr. Hampton on December 8, 1798. This land was near the mouth of the stream now known as Docks Creek. It was first known as Hampton Creek, but later was named Docks Creek in his honor. The home Dr. Hampton built was in this area on a ridge known as Hampton Ridge. A number of years later, this farm was sold to Judge McQuinn. It was on this farm that Dr. Hampton was buried when he died on August 7, 1840 in Cabell County, VA. 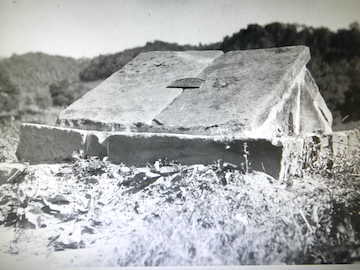 This photograph is of the original burial place on Hampton Ridge. It appears to have been in fairly bad shape when this photo was taken. His body was later moved by the Department of Highways to the Maple Hill Cemetery, which is adjacent to the Docks Creek Cemetery. At this old cemetery, near the grave of Dr. Hampton, were markers for his son Dr. Anthony G. Hampton and wife Susannah (Love) Hampton. These markers were moved to the Maple Hill Cemetery, and placed beside Dr. Hampton’s grave. The family has erected a more modern marker at the grave of Dr. Cary Hampton, shown here.